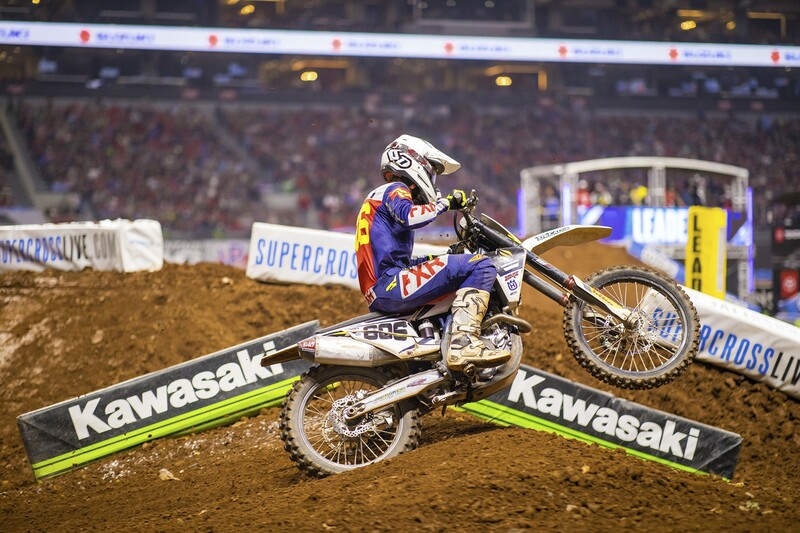 Privateers Tyler Enticknap and Ronnie Stewart were involved in a scary crash in the first 450SX heat race on Saturday night at round 14 in Nashville. Following a crash in the rhythm section, the race was red flagged while the riders were attended to by the Alpinestars Mobile Medical Unit. According to a post on his wife Brooke’s Facebook page, Stewart was knocked unconscious in the crash and suffered some bruising on his body and lung, but he did not sustain any broken bones. "Hello everyone, I know everyone is worried and we wanted to update you when we really knew what was going on. Last night Ronnie was involved in a scary crash that ended in a red flag and was knocked out unconscious for a little while. Those moments were extremely crippling for all of us as we had to wait. When he was brought off the track he was conscious and alert but had some loss of memory. We stayed overnight at the hospital and his memory has made a full complete recovery and is feeling much better than he did when he got here. He has some bruising on his body and lung but other than that he has no broken bones. In times like this we feel lost but we know it could have been a lot worse. Thank you sooo much to everyone for your prayers, texts, calls, website messages, Instagram messages, Facebook messages. If there is one thing I know its that in hard times people have a way of lifting you up when you’re down. The amount of love and support both Ronnie Stewart and I have received along with all our family, has been amazing. Thank you to Jake Vanada and Christy Vanada for leading prayer and for being snacks for me last night. Thank you to our family here in Nashville and at home for always being so supportive and loving. And thank you to the alpine stars medical unit and Doc Bodnar for your quick response, it truly makes a difference. ️Brooke and Ronnie Stewart-RSR Racing"
Enticknap posted on his Instagram page on Sunday that he is scheduled to undergo surgery on his sacrum and pelvis on Monday. He hopes to be released from the hospital later this week.